Description: Westbound Freight On Rockville Bridge Going Into Enola PA. Yard , Lead Engine Is One Of Only 15 Ordered!! Description: NS 7502 is a New Gevo ES40DC heading up NS 144 on the early Thursday Morning. Description: NS 144 climbs the Wabash hill with a Evolution Series GE on the point. Title: NS 7502 leads NS 8831 away to the East. Title: NS 7502 and NS 8831 pass through the station with 20 loaded bogie hoppers. This train left the yard after the previous freight hauled by NS 4637 and NS 3545 reversed into it. Title: NS 7502 and NS 8831 head away Eastwards. Description: 28T is making good time today. 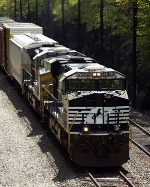 Description: Westbound coal train on the Cleveland Line. Description: One of the first ES40DC's brings 19G west at 2:08PM. Description: NS 7502 approches the East end of the Gallitzen tunnels. Description: NS 7502 passes an old RR structure and heads for the Horse Shoe curve. Description: Eastbound on track two with a GEVO, two Dash 9s, and a switcher at dusk. Description: L89 makes its way toward CP 79 thru the 8 inches of snow we got. Description: NS L-89 backs onto the Red Key from the Marion Branch at CP-79.